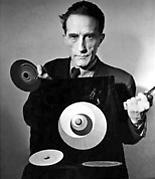 A prominent Dadaist painter, writer and film-maker, Hans Richter was born in Berlin in 1888. He first came in contact with modern art between 1912 and 1913 through the exhibitions of the ‘Blaue Reiter’ and the Herbstsalon. His first works were influenced by Cézanne and the Cubo-futurists as well as by German Expressionism. From 1914, he collaborated with the Berlin periodical ‘Die Aktion’ which was closely linked to the Munich Expressionist movement. In 1916 he mounted a personal exhibition of his paintings and ‘Die Aktion’ dedicated a whole edition to him. In the same year, Richter went to Zurich after being wounded in the War, and joined the first Dada group primarily for political reasons. In 1917 he produced works derived from Expressionism entitled ‘Visionary Portraits’ but also began to make abstract compositions in black and white which were very much in tune with the Zurich Dada group, in particular the work of Arp and Janco, resulting in his ‘Dada Orchestra’ of 1918. While still living in Zurich, Tristan Tzara introduced Richter to the Scandinavian painter Eggeling with whom he shared and developed his ideas about the future of painting and it was during his period of research into an artistic synthesis of space and time, prompted by Einstein’s Theory of Relativity, that he produced one of his key works, the ‘Dada Heads’ of 1918. By the following year he had returned to Germany with Eggeling where he began work on ‘Prelude’ (the first of his ‘Rotules’), a painting made up of a series of eleven drawings mounted on a wheel which marked a major step in his examination of spatio-kinetic relationships. Richter’s concern with spatial structure also led him to experiment with Cubist “simultaneous vision”. The break with traditional pespective in favour of a multiple viewpoint allowed Richter to explore volumetric dimensions all within the flatness of the canvas surface, without the illusionistic depth of academic painting. In the process Richter took early Cubism a step further, preferring a lyrical expression to the previous object- orientated works of Braque and Picasso. In the early 1920s Richter was, besides painting, also involved with cinematographic animation and the publication of the magazine ‘G’ (Gestaltung: Structure) with Graeff and Mies van der Rohe, in which featured numerous Dadaists such as Tzara, Hausmann, Man Ray, Georg Grosz, Kurt Schwitters and Arp as well as members of the Neo-Plasticists such as Doesburg and the influential Russian Constructivists Naum Gabo and El Lissitzky. But from 1926 until 1941, when he left for America, he seems to have ceased all artistic activity. In New York, he was elected professor at the City College and Director of the New York Film Institute which enabled him to make, with the help of Duchamp, Ernst, Man Ray and Léger, the feature film ‘Dreams that money can buy’, which was famous for its abstract colour sequences. He continued his cinematographic career with ‘8x8’ (1956-7) and ‘Dadascop’ (1961), collaborating with Arp, Schwitters and Hulsenbeck. Richter took up painting again during and after World War II, and in 1946 had an influential show at Peggy Guggenheim’s Art of this Century Gallery, the same venue that first staged the Abstract Expressionists. Richter exhibited extensively throughout his life and his work is now represented in major modern art museums worldwide.